Has your smile lost its luster over the years? Tooth discoloration is unavoidable as you age, but there are also several other factors that influence the severity of the change. You have probably tried a few over-the-counter products to revamp your smile; however, you were disappointed with the results. You are not out of options. Dr. Don M. Chaney can help you get the results you want with professional teeth whitening in Fayetteville. We use the GLO Whitening System to turn back the hands of time. Daily wear and tear cause your enamel to thin over the years. This makes more of your yellowish dentin become more visible, making your teeth appear darker. Besides age and genetics, the foods and drinks you consume can also cause you to lose a white smile. Those that are darkly pigmented can stain your teeth. Smoking and tobacco are also leading causes of discoloration. At the first sign of discoloration, you probably tried over-the-counter products. They are convenient, affordable, and come in many different forms. Although they promise to offer results, you will not see a large improvement in the color of your teeth. 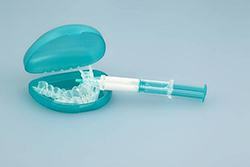 They do not contain professional-grade whitening agents, so they cannot deeply penetrate your enamel. You can get the noticeable, lasting results you want with the help of your cosmetic dentist in Fayetteville. Dr. Chaney provides 2 convenient solutions to give you the results you want. 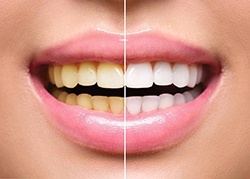 We use the GLO Whitening System to combat tooth discoloration. You will enjoy immediate results using warming heat accelerated technology. A highly concentrated whitening agent is applied to your teeth, which is activated using warming heat and light. In about one hour, you will get your teeth several shades whiter without any pain. If you prefer the convenience of over-the-counter products, you can enjoy professional-quality results from the comfort of your own home with GLO Whitening. We provide you with everything you need to brighten your smile around your own schedule. Dr. Chaney gives you the professional strength whitening agent and trays to use every day for 2 weeks. As the days pass, you will notice your teeth becoming visibly whiter. Your results will last, so you can smile with confidence. You can maintain a bright smile for several years by taking the time to protect your investment. Consume a whitening diet for 24 to 48 hours after your initial treatment. Brush your teeth twice a day for 2 minutes each session using a fluoride toothpaste. Floss your teeth every night before going to bed. Limit your consumption of darkly pigmented foods and drinks. Reveal a Brighter Smile Today! If over-the-counter products failed to give you the results you want, you can reveal a brighter smile with professional teeth whitening. Dr. Chaney has the solutions you need for a beautiful smile. Contact our office today to schedule your consultation.